In terms of costs, the law of increasing returns means the lowering of the marginal costs as successive units of variable factors are employed. Se we are moving towards the optimum business point. It is called law of decreasing costs. Therefore, the other name of law of increasing returns is the law of decreasing costs. In terms of costs, the law of constant returns means the constant marginal costs as the industry is expanded by employing more units of variable factors. By constant costs, the industry moves on the path of optimum business unit. Therefore, the other name of the law of constant is known as the law of constant costs. The law of decreasing returns means the increasing of the marginal cost. So we are moving afterwards the optimum business unit. The tendency on the part of marginal cost to rise is called the law of increasing cost. Therefore, the other name of law of decreasing returns is known as the law of increasing costs. The three laws of costs are explained with the help of the schedule. Let us suppose that the cost of each unit of factor applied is worth $10 only. By employing successive units of variable factors, the marginal cost goes on decreasing up to 4th unit. At the optimum level of production, the marginal productivity remains constant. Therefore the marginal cost also remains constant till the 6th unit of variable factor. When we employ more units of labor and capital the marginal productivity comes down which causes the increase in marginal cost. 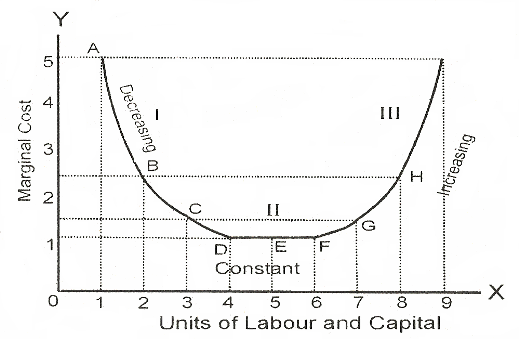 The falling curve with negative slope from point A to D, represents the operation of the law of decreasing costs. The straight line with zero slopes from point D to F shows the operation of the law of constant cost. The increase in cost starts after point F. Therefore, from point to I, the portion of cost curve represents the law of increasing cost and has positive slope.